Election Administrators (EA) LLC is the leader in Mobile Election Technologies. Based in Missouri, EA serves over 180 counties in 14 states across the US. EA aims at providing simple, easy to use, easy to train, cost effective software that government employees can use and trust. Recently, Ohio Secretary of State's Office certified EA's product for their 2014 polling. EA pioneers the use of technology for an easy yet reliable voting process. It has been in business for more than a decade, modernizing the polling booth and the voting process. EA's laptop based Pollbooks have been popular with the voters, judges and poll workers. EA decided to use tablets to enrich the voting experience further and developed first ever android powered electronic tablet for election industry that turns paper voter lists into electronic copies. A touch screen tablet without the need of a mouse was an enticing proposition to all poll participants, young and old. EA faced the challenge of ensuring focus and locking devices to just the polling application. Data involved in poll process was very sensitive and the device had to be secured. EA wanted a solution that would secure the tablets and data. For the purpose of polling the tablets had to be sent to different booths at different locations. EA needed to pre-set these devices and ensure that the settings were not tampered with during transit or polling. The cost of rendering a device unfit for use, even inadvertently, was too high. EA needed to deploy multiple devices at multiple booths so they needed a solution that would allow them to set up a number of devices in short time. After evaluating different products, EA chose 42Gears Mobility Systems for its industry leading lockdown solution - SureLock. 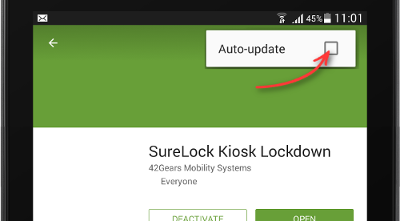 SureLock provides an advanced lockdown of Android devices making it impossible for users to access applications or system functions that are not allowed by the administrator. SureLock provided the necessary restrictions on the device. Social media, web browsers, games were all hidden from the poll workers. Poll workers were allowed to use only the specific applications. Lockdown also ensured security of the data on the device. The sensitive poll data could not be accessed or shared by any unauthorized person or un-allowed application. SureLock mandates that the device settings are password protected so that only admin can access and change device settings. 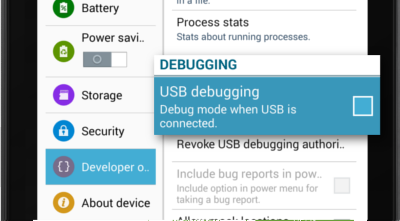 This helps in avoiding downtimes that can be caused due to intentional or unintentional tampering of device settings. As these devices were sent to far off locations, any downtime would impact and delay the whole election process and this was totally unacceptable. EA had to deploy the setting on multiple devices. 42Gears's cloud feature in SureLock helped EA export the settings and replicate it across multiple devices. SureLock met all of EA's requirements for device security, admin control and multi device set up. EA is very satisfied with SureLock. Customers of EA are happy with the tablets in poll process. EA is now equipped to secure tablets with SureLock in very quick and efficient manner. Number of devices and distance are no longer a challenge. With SureLock, EA has been able to take the solution to its various customers and has made the polling process seamless and efficient. "Our experience with SureLock and 42Gears has been excellent. SureLock is a natural fit for our EA Tablet electronic pollbook - simple, cost-effective, customizable, and scaleable to any client size. 42Gears doesn't stop with great software though - their support and response time on even more complex inquiries has exceeded my expectations. Both the product and the company that supports it are highly recommended."